Considering that the test system draws a lot of power, I'd say the Vantec ION2 handled the load pretty well. While the 12V rail only dipped to 11.94V, this was within fluctuation specs. Serious dips in power could the route cause of spontaneous reboots your PC, but differences of +/- 5% are typically expected, and should not cause that type of problem. *All voltages were read from the Motherboard BIOS. When looking at the Seasonic Power Supply test results we see two values, wattage and volt-amps. Since it might not be clear what they measure here's a brief overview: The volt-amp value is actually how much real power is being consumed by the power supply being tested. The higher that value is, the more electricity is being consumed by the power supply. Because no electrical device is 100% efficient, there will always be some loss at converting AC to DC. The closer the volt-amps and wattage figures are to each other, the more efficient a power supply is. This is called the Power Factor: wattage / volt-amps = PF. Since we're testing with a 120W dummy load, the load on the power supply should be as close to this figure as possible. Anything above this load describes the overhead and wasted energy (as heat) for the particular power supply being tested. For the unloaded tests, the wattage and volt-amp figures should be as close as possible to one another first off. Secondly the lower the figures are, the less power is being used. For comparisons sake we're showing how the Vantec iON2 performs next to the very efficient Seasonic SuperTornado PSU with Active PFC. The Vantec iON2 performs quite well in the loaded/unloaded tests, although in the long run will be more expensive to use than the Seasonic SuperTornado. It's sometimes hard to believe that the computer power supply is the least understood device in a system, and the last thing on a users mind. I guess it's not too surprising considering the benefits of using a higher quality PSU is not always apparent. 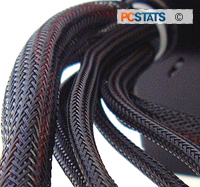 A good PSU won't make games fly by any faster, nor does it increase Excel number crunching speeds. Still, equipping a PC with a low end generic power supply is bad news, and it may be only a matter of time till you're burnt. There's little doubt that most power supplies on the market are generic, and Vantec is doing pretty good at offering consumers a better choice. With a retail price of $60 CDN ($47 US) , the Vantec iON2 is definitely a steal! If you're using junk, you now have no reason not to upgrade to something better. Considering the price I'd say the Vantec iON2 performed quite well when compared to the higher end Seasonic SuperTornado 400. It's not as efficient but if you want features like Active PFC you're going to have to spend a pretty penny more than $60 CDN. Ultimately, if you're in the market for a new power supply but don't want to blow the bank, definitely take a look at the Vantec iON2. It's inexpensive, performs well and looks pretty nice to boot! Pg 2. More details about the iON2!